What is the difference between envelopes with and without windows? Window envelopes have a clear area on the front to allow the address from inside the letter to be seen, this is to save writing out every address individually. Many businesses deal with a constant flow of internal and external mail on a daily basis, employing dedicated teams or departments specifically to organise mail. Well maybe it's time to free up some people power and finances by using envelopes with windows. 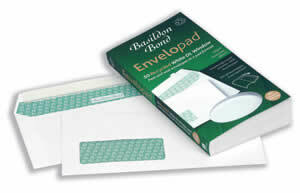 This will eliminate the need for hand-addressing envelopes and printing address labels which both costs money and time. The first windowed envelope was created by a man named A F Callahan from Chicago. He filed a patent for the window envelope on June 10th 1902 and described his invention as an envelope with holes for viewing the letter contents inside. The first windows were made from a lightly waxed rice paper which later developed to windows made from glassine, a shiny and almost transparent paper. Today, windows are made using clear plastic and often recycled and biodegradable corn options. Callahan's invention also meant that envelopes could be printed in colour, which is now a successful marketing method due to its attention grabbing properties. A new thinking is that the space saved on window envelopes can be used to market companies, advertising special offers and new products encapsulated in an eye catching message, font and colour. This table shows the sizes of envelopes and where the window is situated and also its size, there are multiple copies of "DL" and "C4" due to both of these size envelopes having windows in more than one place and size.